In the 2002 Charlie Kaufman/Spike Jonze film Adaptation, there’s a scene where a neurotic writer (Nicholas Cage) is asked how something began, and his manic imagination is sent back to the Big Bang, apes, evolution, on up until when the question was asked. 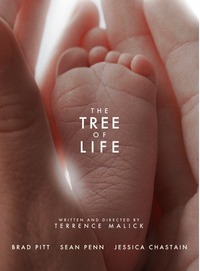 Terrence Malick’s new film, his first for over five years, takes that notion seriously. Initially set in Texas in the 1950s, the film introduces a family just at the moment they lose one of its members. Well-meaning platitudes are expressed such as ‘life goes on’, ‘everything has to change’, and yet Malick uses these bland profundities as a starting point. Grief and loss are the triggers for a journey that some will no doubt dismiss; but anybody interested in the possibilities of cinema to ask genuine questions in a serious manner, anybody who holds that cinema is not exclusively a form of entertainment but also a mode of interrogating the world and our place in it, will be impressed at the audacity and inventiveness of this work. To begin with, the first hour dispenses with the theatrical convention of the scene. What we are left with is almost pure cinema: a series of disjointed, chronologically displaced, and often stunningly beautiful shots. With very little spoken dialogue except for snatches of voiceover, we glimpse jigsaw pieces of lives, guess at relationships, and then embark on a cosmic journey that changes scale from the microscopic to the astronomical. We get the promethean fire of creation, bubbling lava, crashing primordial oceans, even dinosaurs. This whole section plays almost like a cosmic overture leading up to the beginning of the family in a small town in Texas. There’s something marvellously daft in all this, something bathetic (as Kaufman was pointing out in his joke) in the fact that all of creation, all of history, leads up to us, now. Brad Pitt and Jessica Chastain are Mr. and Mrs. O’Brian, living in a leafy almost idyllic suburb, but the point of view we are given is very much that of their children, three little boys. And this is where Malick demonstrates that he is a true master of cinema. The fireworks of cosmic creation are as awe-inspiring as Kubrick’s star-gate sequence in 2001 (1968), but finding the sublime in the creation of stars is not that grand a ask: they are kind of sublime to begin with. Malick manages to capture the same sense of wonder in the banal details of a suburban home. We’ve all seen babies in films, or at least people carrying baby-shaped bundles and pushing prams, but here we really see a baby - a newborn baby in all its weird beauty. It seems fresh. The camera follows the children’s point of view as they grow and we see magic in their widening world - from sunlight reflecting on the wall, to fireflies, as well as the dreaded experience that knocks at its edges and perhaps lies hidden at its heart. There is a joy to this childhood - when they rush into the tall grass, so do we - but there is also cruelty and pain. Although there is more dialogue here, and a conventional narrative starts to emerge (father-son conflict and all), it does so with subtlety. Brad Pitt gives a career-best performance in a role that reminded me of the great literary fathers; I thought especially of Simon Dedalus, Stephen’s father who appears in Joyce’s Portrait of the Artist as Young Man and Ulysses. There is also, here, something of Joyce’s ambition to include the whole of the universe in a simple story of quite ordinary people who don’t get on with their families. Dedalus himself was prone to over-weaning ambition: it was after all he who, in Greek myth, designed the labyrinth, as well as sets of wings for himself and his son. Here I think I should defend my rating above, because this is not a film for all and some will detect on Malick the smell of burnt feathers and melted wax. I do not think this is a perfect film. Sean Penn is given almost literally nothing to do; an occasional false note turns an image into a prayer card cliché. However, the sincerity of the film, and its ability to surprise, finally gifts the viewer with the rare miracle of seeing the world with new eyes. This review was published on May 19, 2011.